Home › FAQ › What Ways Can You Engage With the Instructor in a Large Lecture Hall? 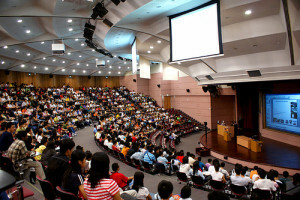 Despite being among potentially hundreds of other students, it is possible to engage with the instructor in a large lecture hall. Doing so is vitally important at the end of the semester, when one or two points can make the difference to a final grade. It is also important in semesters to follow, when professors seen in those lecture halls are seen again in smaller classes and when moving on from college, as those instructors can be vital sources of recommendations. At most colleges and universities, a class’s instructor of record will have to maintain a set number of office hours. Professors often spend those hours alone into their offices, working on one of the various projects they have to carry out as part of their expected duties, but they are required to meet with students during those hours if the students are, in fact, present. Attending office hours is therefore one of the best ways to make contact with an instructor, whether in a large lecture hall or a smaller, more intimate class. Office hour times will generally be listed on the course’s syllabus; the course’s department will also have a listing of the instructor’s office hours. It is not enough to attend office hours, though. Making a good impression during the office time makes a big difference. It is the only way to get letters of reference, which are vital to hiring and graduate study, from a number of professors, according to Chris Healy at the University of Louisiana at Lafayette. While at the office hours, focus on asking questions that allow the instructor to showcase hard-earned knowledge and expertise, as a HubPages article notes. Those who attend early and often, and ask after leading and current research, will soon find that the instructor knows them and holds them in esteem, making future coursework and professional networking all the easier. What If I Cannot Attend Office Hours? It does happen that students’ schedules conflict with the instructor’s office hours; there are other classes, after all. Many or most instructors are happy to meet by appointment outside of those times, although it must be kept in mind that the instructors have other classes to teach and other duties to which they must attend, so they are not infinitely available. Email is usually the best way to set up such an appointment; indeed, a report notes that one professor refuses to read student emails for any other purpose than to set up an appointment, according to Inside Higher Ed. Meetings outside office hours will follow much the same patterns as meetings during office hours. They will still need to create a favorable impression of the student, and so asking the same kinds of questions and making the same kinds of comments will be of benefit. There is the added need, however, of punctuality. By offering an appointment, the instructor is going beyond what the terms of his or her contract require; the instructor is providing time and attention for free that could be spent on other projects and other jobs. Being late is disrespectful, and it will have the exact opposite of the desired effect. Future appointments will likely not be offered, and the annoyance will not be forgotten soon. It is intimidating to be one student among several hundred. It is much less so to engage with the instructor in a large lecture hall outside of class time, and it is of much more benefit.